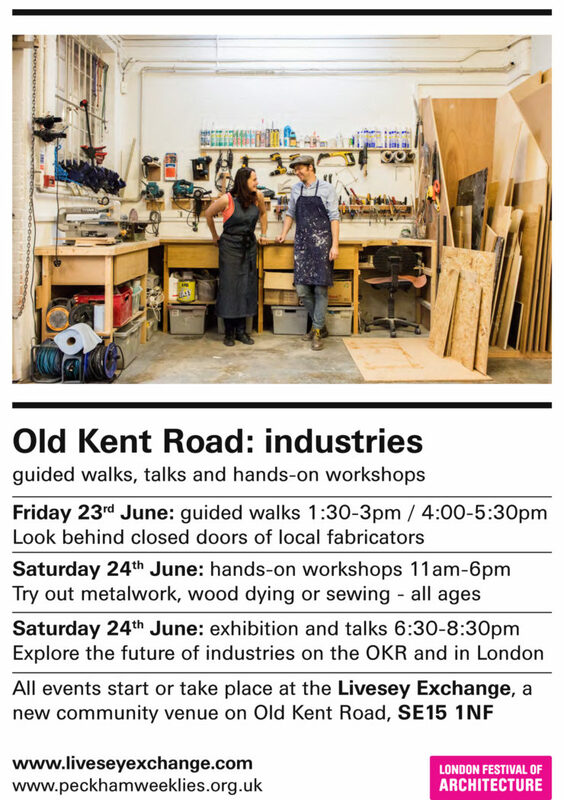 The Peckham Weeklies in collaboration with the Livesey Exchange, local businesses and business association Vital OKR are organising a multi-day event on the 23rd and 24th June including guided walking tours taking visitors behind closed doors of local industries, hands-on workshops at the Livesey Exchange, an exhibition by CASS Cities and a series of talks exploring the future of industries in the city. On the 24th June there will be hands-on workshops at the Livesey Exchange from 11am-6pm including metal work with Power Project, wood dying with Designer of the Year Raw Edge and apron sowing with Community Thread. Please wear sturdy shoes when participating in the workshops. 11:00-15:00: Metalwork with Power Project who run the temporary workshop at the Livesey Exchange. Join James Green, Maya Alvarado and Louise Colgan. 13:00-16:00: Wood dying with Raw Edge, Designer of the Year 2017. 13:00-16:00: Sewing with Community Thread. Join Hannah Cawley and lean how to make an apron. In the evening of the 23rd from 6:30pm an exhibition by CASS Cities and a series of talks by Mark Brearley, Dr. Oli Mould and Lucy Bullivant will explore the future of industry in the city.